Old School Deviled Ham Salad, made with ground ham, sweet pickles, pimentos and mayonnaise. My version adds in celery and onion, and a little horseradish, spicy mustard, hot sauce and Cajun seasoning with the mayonnaise. Back in the day, this deviled ham salad was made using an old fashioned countertop grinder - the cast iron kind, that clamped onto the edge of the kitchen counter or a table. Usually a slice or two of bread would be run through first, just to sort of clean it of any dried, leftover residue, since they were next to impossible to clean well. Everything else was added to the grinder in order, and then the salad mixed together with a homemade mayonnaise. The old school ham salad was a even more simplified than this version here - made from ground ham, (and very often, from less expensive ground baloney instead), sweet pickles, sometimes pimento peppers, and mayonnaise, or for some folks, a salad dressing like Miracle Whip. Just remember if you are already using a sweet ham, like a honey baked ham, you'll want to take care with a sweet dressing on top of sweet pickles. Of course, while sweet pickles are most traditional for deviled ham, I won't tell a soul if you choose dill over sweet, if that is your preference. I like to add in celery and onion and spice up my mayo just a tad with some spicy mustard, hot sauce, Cajun seasoning and a little horseradish to give it a little punch. By the way, deviled when used in recipes such as this, and deviled eggs for instance, means nothing closely related to a pitchfork toting, evil red devil who makes you do things that your mama taught you better. It simply refers to the seasonings used in certain dishes - in a nutshell, it translates as something that is highly seasoned, and this, would be that. Let's make some deviled ham salad - here's how. Use a grinder or a food processor to mince up a couple of nice, thick slices of ham. You'll want about a half pound, or what will amount to about two and a half cups of ground ham. If you're using the traditional, whole gherkins, grind those too. Transfer to a storage bowl because once this is all mixed up, you'll want to refrigerate it for a few hours or overnight to let the flavor meld. I substituted a well-drained, homemade sweet pickle relish that I made this past summer. Add the pimentos. I'm using a small jar of already chopped pimentos, but if you're using whole pimentos, add those in with the ham and pickles when you grind them. Grind the onion and celery, or mince and add in. In a separate bowl, whisk together the mayonnaise with all of the remaining ingredients until well blended. Pour the mayonnaise over the ham mixture and mix well. Taste and adjust the seasonings as needed. Refrigerate for several hours until needed so that the flavors can meld all together; overnight is even better. Spread on crust-less white bread, cut into triangles, for small finger sandwiches and serve with pickled okra and kettle chips, or scoop onto a plate as pictured here, alongside celery and carrot sticks, and serve with a few kosher dill pickle spears or okra and your favorite crackers. 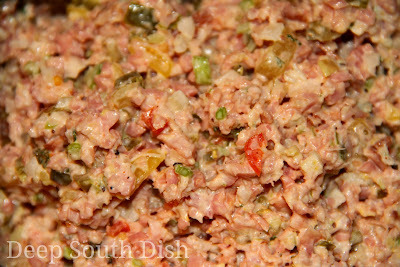 Use a grinder or pulse ham in a food processor until minced; add to a lidded storage bowl. Grind or mince the pickles and add to the ham. Add onion, celery and pimentos and mix together. In a separate bowl, whisk together the mayonnaise with all of the remaining ingredients, until well blended. Pour over the ham mixture; mix well, taste and adjust seasonings. Refrigerate for several hours until needed; overnight is even better. Spread on crust-less white bread for finger sandwiches and serve with a side of pickled okra and crispy kettle chips, or scoop onto a plate alongside celery and carrot sticks, and serve with pickle spears and crackers. Cook's Notes: Grind or finely chop a few hard-boiled eggs to add in. For a basic ham salad, use only the ham, pickles, pimentos and mayonnaise. For bologna salad, substitute ground bologna. You may also use sweet pickle cubes or relish, but drain well before adding to the ham. Use additional mayonnaise as needed for desired consistency. You're welcome - it's good too Dorothy!! I've been wanting a recipe for this. My Granny used to make this all the time. Thanks so much for bringing back good memories! You're welcome. I hope that you enjoy it! No snow down here on Coastal Mississippi just rain, storms & cold Don! Mama Nature can never seem to coordinate all that at the same time in my world. Sure would love to see a white Christmas before I leave this earth!! 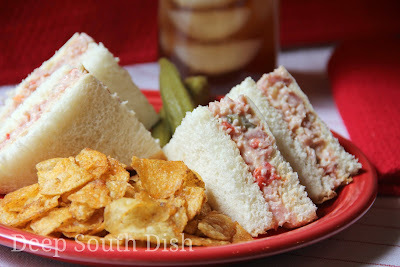 This is old school ham salad, that really most often was made in the faux way using bologna. It's different from my typical ham and egg salad that I love, but it really is very good! I still make this usually once a month but I use bologna, sweet pickle relish, hard cooked eggs(for mys husband)and only Miracle Whip. I use my Cuisinart to grind the bologna. My husband loves to have these sandwiches when I make a pot of chili. This is my family's Kentucky way to make ham salad. I know I'd love your version too! My mother used to make these when I was a kid. She used balogna and I'm sure Miracle Whip. She would put this in hotdog buns, and toast them. I never liked them, but I think my sister did. A lot of folks like Miracle Whip with this one and it was very often made with bologna just because of the cost. I like both, though I do prefer it made with leftover ham. Happy New Year!! My Mama used the cast iron grinder (wish I had it) to make baloney salad when we were kids. I love this stuff! In fact, I bought the ingredients to make baloney salad for my daughter for New Year's. I'm going to use your recipe. Thanks so much for all your great recipes!!! Happy New Year! I hope she enjoys it Mimi - Happy New Year to you too! You can purchase different size cast iron grinders on e-bay for reasonable prices. I have a variety from small to extra large. This ham/'meat salad is excellent for get-togethers. Make it at least once a month and always add/grind 8 hardboiled eggs.....jazzes it up!! This sounds delicious Mary and we still drag out the old meat grinder for certain uses, but it has been mostly replaced by the one that mounts on the Kitchen aid mixer. I'm impressed you still have the old one Larry - Happy New Year! Just made this with our leftover Christmas game (tripled the recipe) and it is super yummy! Hubs is a very happy man right now! Thanks for the great recipe and a reason to use our new kitchen aid meat grinder! You're welcome - Happy New Year Delancey!! I know what you mean Anne - Happy New Year! I am a huge fan of deviled ham but haven't had it except from the Underwoods can in forever. I need to get a ham soon just so I can make this. I love this stuff Chris! Wow, Mary! This brings back the memories. I remember mother sending us girls down the road to the store for $1.00's worth of baloney. We would have sandwiches for lunch all week long. A cold baloney sandwich was surely tasty after chopping out tobacco all morning. When there was extra cash, which wasn't very often, mother would make "baloney salad", just as you described. She would run white bread through the grinder to "clean" it out. My sister and I took turns cranking the grinder while she put in the baloney, pickles and whatever else she added. That was certainly some good stuff!! Love your recipes and Happy New Year to you & yours!! Thank you so much & Happy New Year to you also!! Thank you Sandie & welcome!! Happy New Year!! Hey Mary, my family will not eat pork; I know! can you believe it? Anyway I was thinking of trying the bologna, do you think it matters if it is the beef or chicken bologna (thinking texture here), or perhaps even some poached chicken tenders might work? Thank you for sharing. I am new to your site just found you when looking for an old fashioned copper penny recipe and have signed up to follow. Looking forward to the sharing. Happy New Year! Hi Denise & welcome!! You'll want to look for a chicken, turkey or beef bologna - just check the package to make sure there isn't any pork in it. I also have several protein salads including two chicken that I love. You'll see them here just scroll down to where it says "Protein Salad" - one is called Chicken and Egg Salad which is like a deli style chicken salad (really good!!) and the other is Chutney Chicken Salad (my favorite!) Hope that helps & Happy New Year! Next to split pea soup, this is one of my favorite things to do with leftover ham. I find it very interesting, however, that you choose to use gherkin pickles instead of what the majority of southern recipes call for, sweet pickle relish. Gherkins were a staple in our home in NYC as well as being a favored condiment at all holidays. Another staple was B&G or Heinz India Relish. I’ve not been able to find it since moving to SC. It’s worth a try if you can find it. It’s not too sweet and not too tart. It’s right up there with my favorite, that ‘day-glow’ green, B&G’s Emerald Relish. That's just how it was made many, many years back, not with a condiment of sweet relish, but whole sweet gherkin pickles that were placed right in the grinder, and I wanted to retain the integrity of how this recipe was originally made. Of course, most Southerners probably don't use an old fashioned counter grinder anymore (heck half probably don't even know what that is!) so relish would certainly be appropriate. The only difference is the relish is already all chopped up for you! The gherkins were certainly a staple in my Southern home too - they were actually my favorite pickle growing up! I still favor sweet pickles - bread & butter are my favorite - but I'm just as fond today of kosher dills and eat one just about every day. Wow! That’s the way Nana taught me how to make it almost 60 years ago; with the gherkins, and all of it ground up in the old hand grinder that was clamped to the end of the kitchen table. Here’s something I discovered about 15 years ago. I dice up some Texas Sweet & Hot Jalapeños in lieu of the Gherkins. It’s not really that hot. I’m not a chili head. I’m Irish. My palate goes flambé real quick. It just adds an incredible flavor with just the right amount of heat. If you like pickles, check your local Walmart. The one here in Camden, SC, recently started carrying Guss’ Pickles. They’re one of the all time best Kosher dill pickles on the planet. I remember these from when I was a kid in NYC: Only then we got them out of a barrel, not a jar. They make the all-time best fried pickles out there. They say that fried pickles are a southern thing. They were popularized in the south in the mid 60’s. They actually originated in NYC in the late 1800’s. I don't recall having see Guss' pickles but I'll sure look for them! I had a little giggle at "My palate goes flambé real quick." I'm about the same way - I love spicy food and do like a nice heat, but I do go south on it real quick if it's too much. Never thought to connect that to my Irish heritage, but that makes sense! Many of my "old" Southern cookbooks use pickled Jerusalem artichokes. Usually so that too, better than regular pickles.. I'm a pickle lover - almost always eat one big kosher dill a day, so it'd be hard to beat pickles for me. The artichoke addition is interesting - I haven't heard of that before, but I bet that I'd like it! Wow. This takes me back! Mother would get out the grinder, clamp it to the counter and grind up the bologna, pickles, cheese, add Miracle Whip, and make sandwiches. Then off we would go on a picnic or to the drive-in picture show. I still have grandma's grinder. Think I'll get it out and make this again. I don't remember that mother put eggs in it, but I bet it is good, too. I don't typically add the boiled eggs to this "deviled" version either, although I do add them to my other, more basic version of ham salad, or really my egg salad with ham. I like the flavor that they add! Still have a grinder from my mom and use it a few times a year (cranberry fluff) and of course for a variation of this recipe. We call it goop. And there was nothing better in the summertime than a goop sandwich on cottage bread. Ours always used bologna, and raw onions. This is a great cheap lunch to feed a load of kids or company. People think they won't like it -- but one bite and they're hooked! Hi Joyce! So sorry for the inconvenience, however while I have considered adding a photo to my printable, most of my readers appear to not be interested in a printable containing a photo, due to the extra ink it uses. To add a second option of a printable with photo means that I have to create separate documents which would be horribly daunting for me to do for all of my past posts since 2009! I'm just a small blogger, sharing recipes out of my kitchen. As to the photo download restriction, I had to put that into place because rogue Facebook pages that "share" recipes, were stealing both recipe text and photos from me, and many other bloggers, often attaching our photos to recipes that they had stolen from other sources by copying and pasting the text. So in other words, our photos were being shared with recipes that didn't even match the photos. There are people out there who don't want to do the work, but do want to share in the "glory" by pretending that they did the work while stealing from those who actually did the work. I may at some point reconsider the photo restriction, but don't plan to immediately, until I am assured this practice has stopped. Bloggers are independent business people who work very hard on recipe development and our blogs, so I do hope you understand, but stay tuned however, as all of that is always subject to change! One thing that you can do is bookmark the recipe that you print in a folder called Deep South Dish. Then when you return to the recipe, you can go visit the link and see all of the step by step pictures as well as the finished product. Thanks so much for supporting me and my work here at Deep South Dish. My Mother's family is descended from Pennsylvania Dutch (many generations ago) and this recipe is quite close to what she would make with leftover ham. Some also make it with Swiss cheese and sauerkraut, which is also delicious. Thanks for reminding me of a childhood favorite. You're welcome! In the south, this was most often made with bologna because of the cost of ham, which was typically only served on a major holiday. We make it more often these days with leftover ham.